For the 2013 - 2014 school year, our Architecture Practicum 1 class has been assigned to design a visitor center for the Fort Worth Prairie Park, one of the last pieces of natural prairie land in Fort Worth, TX. The goal of designing this nature center is to bring people to the prairie in order to teach them about the prairie ecosystem and raise environmental awareness. With support from the Great Plains Restoration Council or GPRC, the Fort Worth Prairie Park hopes to one day preserve 2,000 acres of prairie land and use our designs to construct a complete visitor center. On the following page you will find a live Twitter feed of our class along with a collection of various research topics, preliminary work, and site visit photography. For the spring semester there are 2 students in the practicum studio who are involved in this project. Our CCE Architecture Practicum class along with several other students from Graphic Design visited The Audubon Trinity River Nature Center and Perot Museum to gain inspiration and a deeper understanding of the function of nature centers. Our architecture class is designing building concepts for the Fort Worth Prairie Park while the graphic design class created various forms of visual media to spread awareness for the park. A few photos of the chosen site for the second semester practicum class. These photos were taken during our class visit to our chosen site for the Fort Worth Prairie Park. Seeing the prairie in person allowed us to gain knowledge of different aspects of the prairie such as vegetation, animals, climate, and geography as well as client needs. Much of our research information was laid out on a poster sized collage. 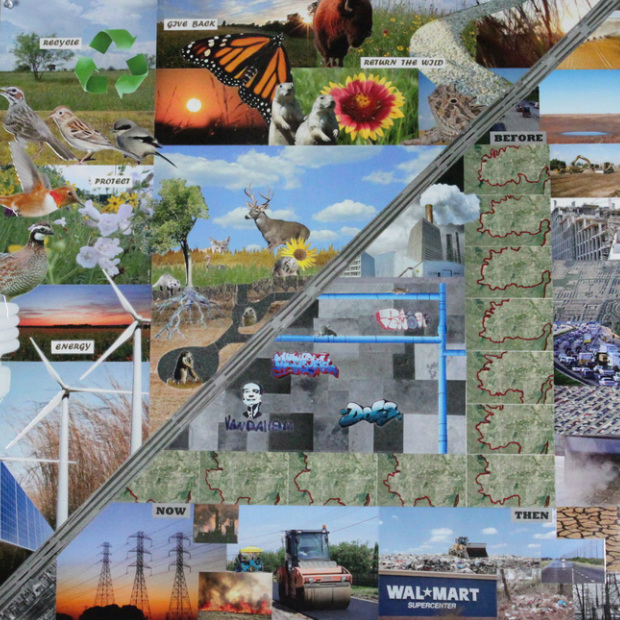 Designing a collage allowed us to display information on the prairie in a creative way while visually demonstrating the problems that exist between DFW and the surrounding prairie (or any city and ecosystem for that matter). The left side of the collage takes on a loose, organic form to represent nature, display native prairie plants and animals, and show different ways to help preserve natural ecosystems. The right side of the collage takes on a more rigid, grid-like form to represent the city and show the effects of urban sprawl and pollution. Through the middle of the collage runs a highway which reveals the contrast between nature and the city, but also represents highway 121, which runs near our site and splits the prairie in two, further hinting at the effects of urban sprawl. Preliminary research of the prairie was laid out in an infographic which illustrates current problems within the prairie and Dallas/Fort Worth as a whole. Also included are solutions to these problems and information on the Fort Worth Prairie Park and their goal. After our site visit and prairie research we moved on to designing a shared site model for our two concepts. The site we chose is a 2,000 x 1,500 ft piece of land located in Crowley, TX, southwest of Benbrook Lake and just north of highway 121 (still under construction in this area). Old Granbury Rd, which runs north and intersects 121, will provide access to the park. This site model, built to 1:100 scale, provided us with a platform to test various study models on and also served as a base for presenting our works in progress. To build the model we first designed a model in Google SketchUp using terrain from Google Earth, then printed the topography in large scale which we used as a template to construct the final model.